Part Big Lebowski, part Fear and Loathing in Las Vegas, part Boogie Nights. Sound intriguing? Read on. When I saw the ad for Inherent Vice, I was like “meh, probably not for me.” That is until the very end when I read the fine print: “Directed by Paul Thomas Anderson, Based on the book by Thomas Pynchon.” I pulled a complete 180 on my apprehensions about the movie and dove in, head first, on the second day of its nationwide theatrical release. I haven’t done that in quite some time, and I am ashamed to admit that although I have this (rarely updated) movie blog, I prefer to wait until the movie comes out on Netflix. PT Anderson is the architect for such movies as There Will Be Blood, Boogie Nights, and my personal favorite, Magnolia (among others). In fact, my last review here was on his other most recent film, The Master, which, like Inherent Vice, starred Joaquin Phoenix as the protagonist. 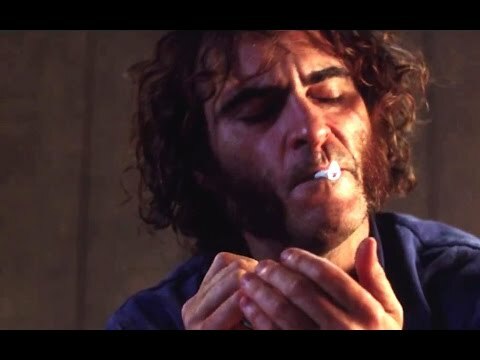 And like The Master, I don’t think that Inherent Vice quite hit the mark of those past films for me. I did like it much more than The Master, with the once exception being that I am sad it didn’t/couldn’t include Phillip Seymour Hoffman, for obvious reasons. 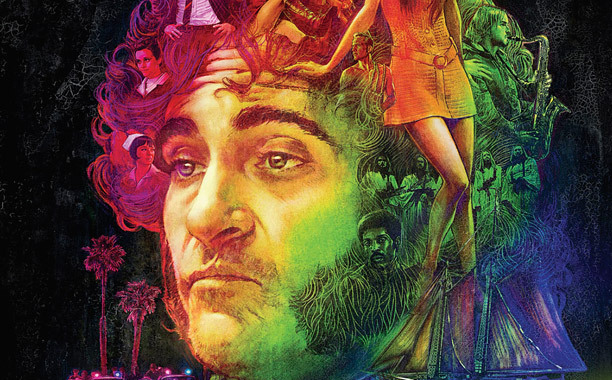 Joaquin Phoenix stars as Doc Sportello, a perma-stoned Private Investigator in 1970’s SoCal, following a breadcrumb trail of several different cases that twist and turn and intertwine in unexpected and comically unbelievable ways. Doc is the most lovable Joaquin Phoenix that I have ever experienced, so that is the a plus. Because of his permanently stoned state, Doc finds it just as incredulous as the viewer that all of these cases so coincidentally cross paths. His intoxication- mostly all of the joints in the tri-state area, along with an occasional nitrous tank or bump of heroin- is absolutely contagious. As a viewer your eyes will turn red, your perception will become hazy, your sense of humor will sharpen, and you will experience this ridiculous journey almost as stoned as Doc is. It’s truly unexplainable, and worth viewing the movie for that entertaining aspect. 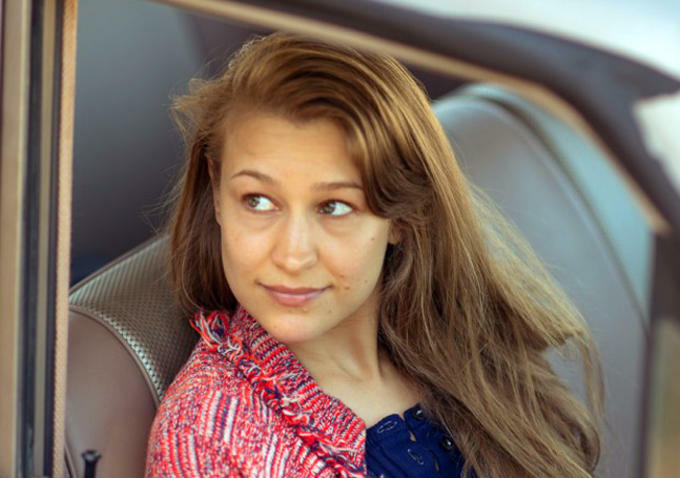 In addition, my beloved Joanna Newsom is an inspired choice for the narrator of the film (with occasional physical appearances). The star-studded cast is also a delight, and you never know who is going to make an appearance next (unless you ruin it by reading the cast list ahead of time). Although I am sure it is simply preserving the old school sentiments of 77-year old author of the novel, Thomas Pynchon, I cannot help but detest the sexist nature of this movie. The female characters are neither complex nor do they seem to act as agents of their own desires, but rather they exist as objects for the male gaze. (Although Joanna Newsom’s character, Sortilège, is actually rather sage and omnipotent, the only female character represented thusly). I find this incredibly frustrating, because I tend to like controversial movies that many people would find uncomfortable or that pushes boundaries of human decency, but I am somehow unable to get past this part of Inherent Vice, as much as I wish I could just ignore it. I am just sick of seeing movies that are so obviously written for men and by men without much consideration for women other than as some kind of accessory to the far more important male characters. This is my complaint with two of Wes Anderson’s recent movies as well: Darjeeling Limited and Grand Budapest Hotel. I’ll give the movie a B, because I still found it wildly entertaining, and it is an uncomfortable movie. And as I mentioned, I am always a fan of those. Just like when I went to the theater to see Life Aquatic, I found myself laughing aloud a little more often than the rest of the moviegoers. Joaquin Phoenix and his constant high confusion kept me in a state of trying-to-hold-back-giggles throughout the movie, and although it was 2 and a half hours long, it didn’t feel as painfully long as I thought it might (thinking back to There Will Be Blood).